W trek in Torres del Paine National park is a good compromise between short day hikes and long O-circuit. It offers great hiking experience in Patagonia, stunning scenery, good facilities and moderate level of difficulty. Permits – entrance fee – CLP 21 000/US$32 in season, off season (May to September) – CLP 11 000/US$17. Confirmed campsites/hotels booking for an overnight stay. Accommodation – campsites, refugios (hostels), hotels. In high season (December – February) it’s highly recommended to book accommodation in advance. The W-trek is not a circuit, it starts and finishes at different points. Book campsites beforehand and bring a printed booking confirmation and a passport with. Hikers are allowed to camp only at designated campsites. Open fires are not allowed in the park – in the past they caused terrible fires. Hikers are allowed to use camping stoves only at designated areas (campsites). Drinking water can be found all over the park, it says to be good quality. We didn’t use any filters or purification. Puerto Natales is the best place to be based before or after the hike; the town has many hotels, several campsites, restaurants, shops and gear rental places. You can get more information about Torres del Paine including different route options, campsite booking etc. at Erratic Rock (hostel/gear rental shop) there is a free daily talk at 3pm. Park entrance fee can be paid only in Chilean pesos (CLP), cards and other currencies are not accepted. Most of the trails in Torres del Paine have cut off time after which you’re not allowed to start walking it. Check the times below. Weather-wise November to March are the warmest months, day temperatures are between 12°C and 15°C, nights are between 8°C and 10°C. Wind in Patagonia can be quite hectic, summer months, except February, are quite windy – November and January are the windiest months. As for rain in January, March and April you’ll get the most rainfalls, February is again quite a favorable month with the least rainfalls. Out of weather point of view February would be an ideal month for trekking in Torres del Paine if it wasn’t the busiest months in the park with the most visitors coming here. For more details on hiking in the park read our Torres del Paine complete guide. More information on other trekking routes in Torres del Paine you can find in our posts O circuit guide and Day hikes in Torres del Paine. Outdoor activities always involve a risky part with a possibility of getting an injury it’s always advisable to have insurance that can cover you in case something goes wrong, like in my case when I lost my backpack hitchhiking to Torres del Paine. World Nomads Insurance operates worldwide they offer special insurance packages for hiking, let your insurance company worry about you while you enjoy the hike. Many people have used this insurance for trekking in Torres del Paine National park. Doesn’t matter where you live or where you are at the moment, it takes less than 2 minutes to get a quote and you can buy it online even if you are already traveling. Always read the small print and be sure you buy the correct policy. Be properly covered for injury, evacuation, gear loss, trip cancellation and trip delays. Want to know what other travelers say about World Nomads? Check out this post! The W-trek has a lot of infrastructure; designated campsites with good facilities, hotels with restaurants and small shops – surviving is not a problem. The trail is well marked; many signs, maps and people – you won’t get lost here. You have to plan the hike, book campsites etc. Walking with a loaded backpack. Setting a campsite; pitching tent, cooking, packing after a long walking day all by yourself. It’s not necessarily a disadvantage we love doing it but if you’re not a seasoned hiker it might be a pain. 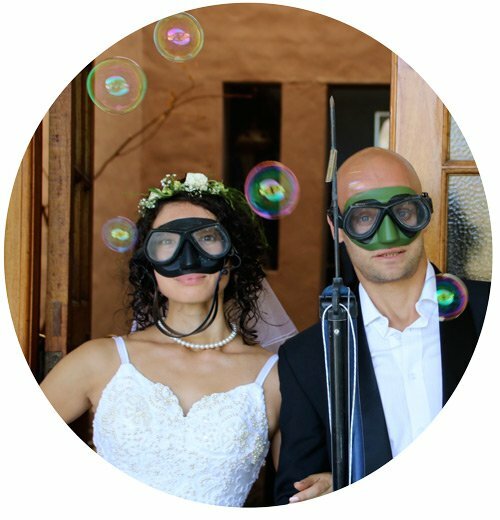 Easy – no arrangements, bookings, gear rental etc. your tour company will do everything for you. No cooking, pitching and breaking down tent etc. Takes away adventurous part of the hike. Transport – bus Puerto Natales – Torres del Paine – CLP 15 000/US$23*, return. Catamaran Pudeto – Paine Grande – CLP 18 000/US$28, one way. Bus Hotel Las Torres – Laguna Amarga (optional) – CLP 3000/US$5. Entrance fee – CLP 21 000/US$32 in season, off season (May to September) – CLP 11 000/US$17. Accommodation – campsites between CLP 5000-13000/US$8-20; refugios (hostels) – between US$60 and US$80 per bed; hotels between US$130 and US$350 for a double room. Note! There is only one free campsites on the W-trek – Italiano campsite. Food – cooking your own food – US$10 per day per person; eating at the park restaurants – between CLP 11 000/US$17 and CLP 16 000/US$25 per meal. Gear rental (optional) – to rent camping gear (tent, sleeping bag, cooking stove etc.) in Puerto Natales will cost you between CLP 13 000/US$20 and CLP 20 000/US$30 pp. per day, depending on what you rent. You can rent a tent, a mat and a sleeping bag at most paid campsites though it’s more expensive than in the town. * You can check up-to-date currency conversion here. Guided 5-day W trek tour start from US$1200 it includes accommodation (Eco camps or hotels), transportation, guide, park entrance fee, ferry ticket, luggage transfer, all meals, gear (sleeping bag) if needed. It’s quite a bit more expensive but more comfortable and easy – no planning, booking or cooking involved. Campsite Italiano – Campsite Frances – 2km/1,2 miles, 30 min. 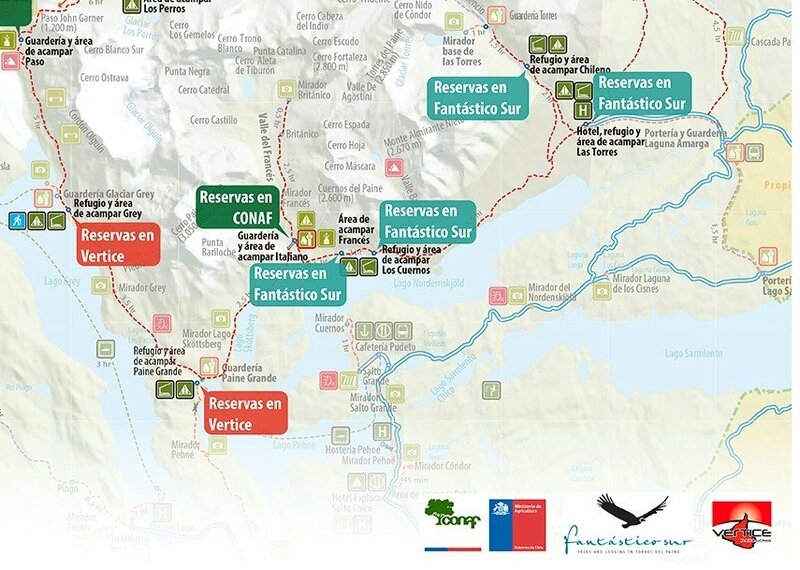 The campsites on the W-trek belong to three different companies; CONAF (the National Forest Corporation) – free campsites – campsites Italiano and Torres (closed for 2018/19 season); Vertice Patagonia – paid campsites – Grey and Paine Grande; Fantástico Sur – paid campsites – Las Torres, Los Cuernos, Frances and Chileno. Paid campsites have better facilities and are easier to book as there are more camping spots than at free campsites. Italiano, Valle Frances, opened from October to April. Torres, closest to Las Torres, CLOSED FOR 2018/2019 season!!! Grey, Grey glacier, max 60 people, opened all year, CLP 5000/US$8 pp. Paine Grande, Pehoé lake, max 200 people, opened all year, CLP 6000/US$ 9.30 pp. Las Torres, Hotel Las Torres, 150 camping spots, opened September – April, CLP 13 000/US$20 pp. Los Cuernos, Nordenskjold lake, 50 camping spots, opened September – April, CLP 13 000/US$20 pp. Francés, Nordenskjold lake, 1 hour walk from Los Cuernos, 50 camping spots, opened October – April, CLP 13 000/US$20 pp. Chileno, for 2018/19 season the closest campsite to Las Torres, 50 camping spots, opened October – April, CLP 13 000/US$20 pp. All the campsites can be booked online; book CONAF (they are still implementing new booking system as for August 2018 it doesn’t work yet); book Vertice Patagonia; book Fantastico Sur. Print your booking confirmation and take it with. If CONAF online booking system doesn’t work you can book free campsite Italiano at their office in Puerto Natales, Manuel Baquedano st. 847. Take a bus from Puerto Natales to Torres del Paine. The journey to Pudeto with one stop at Laguna Amarga takes 3 hours. Price CLP 15 000/US$23 return pp. Get off at Laguna Amarga entrance (first stop) to pay the park entrance fee – CLP 21 000/US$32. Get back on the bus. Get off at Pudeto (second stop). Buy catamaran ticket (one way ticket the trek finishes at different place). Take the catamaran (ferry) from Pudeto to Paine Grande. The ride takes about 30 minutes. Price CLP 18 000/US$28 one way. Note! In high season January – February the catamaran might go more often. Cost; bus – CLP 15 000/US$30 (return), entrance fee – CLP 21 000/US$32, ferry – CLP 18 000/US$28 (one way), camping at Grey campsite – CLP 5000/US$8. Several ascends and descends on the way between Paine Grande and Grey campsite. 7.00-7.30 – catch a bus from Puerto Natales to Torres del Paine National park. 9.30-9.45 – get off at the first stop Laguna Amarga to pay park entrance fee. Tip! Try to be among the first people at the office not to wait for too long you still have to get back on the bus. After paying the fee, getting tickets and maps get back on the bus that goes to Pudeto. 11.00 – get on the ferry to Paine Grande. 11.30 – get off the ferry at Paine Grande. Here you have to options; to camp and Paine Grande and walk to Grey glacier with a day pack or to walk to the glacier and camp at Grey campsite. If you camp at Paine Grande you’ll walk to the glacier with a day-pack but you’ll have less time to walk around and to go to the distant glacier view-points. If you camp at Grey campsite you’ll have more time to explore the area but you’ll have to walk with your backpack to and back to Paine Grande. 11.30 – start walking toward Grey glacier, 11km, it’ll take you between 3 and 4 hours. 15.30-16.00 – arrive at Grey campsite, pitch your tent, have lunch. 17.00 – walk around the campsite, go to the lake. You can leave your stuff in the tent but we’d suggest to take valuables e.g. camera, money with. 18.00-19.00 – get back to the campsite, have dinner, rest. Cost; camping at Paine Grande – CLP 6000/US$9. 7.00 – get up, have breakfast. 8.00 – start walking towards Paso campsite, to the view-points. Leave your stuff in the tent at the campsite, take a day-pack with valuable stuff, water and snacks. 9.30-10.00 – you’ll arrive at a look-out, there are several points from where you can see the glacier. From here we’d suggest to start walking back you still have to pack your tent and walk to Paine Grande. 11.00-11.30 – arrive back at Grey campsite, pack your tent, have lunch. 12.30 – start walking to Paine Grande. 16.30-17.00 – arrive at Paine Grande, pitch your tent, walk around. 19.00 – make dinner, rest. 6.00-7.00 – get up, make breakfast, pack. 8.00 – start walking towards Italiano campsite – 7,6 km, 2,5 hours. 10.30 – arrive at Italiano campsite, leave your big backpack at the office and walk to Mirador Frances – 2km, 1 hour. 11.30 – arrive at Mirador Frances, rest, have lunch/snacks. If the weather is good and you feel strong continue walking towards Mirador Britanico – 3,5 km, 2 hours. 13.30 – arrive at Mirador Britanico, rest, enjoy the view. 14.00 – start heading back to Italiano campsite – 5,5 km, 2-3 hours. 16.30 – arrive at Italiano. If you camp here start pitching your tent, have lunch. The rest of the day you can relax, read etc. If you camp at Frances you still have 2 km, 30 min. to go. Cost; camping at Chileno – CLP 13 000/US$20. Staying at Chileno is currently the only option if you want to see the sunrise at Mirador Las Torres. Free campsite Torres that is just 800m away is closed in 2018/19 season for maintenance. From Chileno to the Mirador is 2,5-3 hours walk which means you have to start at 3.00-4.00 am in summer as the sunrise is between 5.30 (December) and 7.00 (February). 7.00 – get up, breakfast, packing. 8.00 – start walking towards Los Cuernos – 5km, 2 hours. 10.00 – arrive at Los Cuernos, stop for rest and snacks. Continue walking towards Chileno campsite – 15km, 5,5 hours. 15.30 – arrive at Chileno, pitch tent, walk around, rest. 18.00 – make dinner, rest. Day 5. Chileno – Mirador Las Torres – Puerto Natales, 14km, 5h30min. Cost; bus Hotel Las Torres – Laguna Amarga – CLP 3000/US$5, bus Laguna Amarga – Puerto Natales – paid (if you bough return ticket in Natales). Las Torres – three sharp mountain peaks and the lagoon. 4.00-5.00 (depending on sunrise time) – get up, start going up to the Mirador – 4km, 2h15min. 6.15-7.15 – arrive at the Mirador. Enjoy sunrise, spend some time resting, taking photos, exploring the area. 8.00 – start going down to Chileno – 4km, 1h30min. 9.30 – arrive at Chileno, get your stuff, start descending towards Hotel Las Torres – 5,5km, 1h30min. 11.00 – arrive at Hotel Las Torres, from here you can catch a shuttle bus to Laguna Amarga (confirm departure time at the hotel) or walk – 7km, 2 hours. 14.00-14.30 – catch a bus from Laguna Amarga to Puerto Natales. We’d recommend to check bus timetable at the park office at the beginning of the trek. 16.30 – arrive at Puerto Natales. If for some reason your time in Torres del Paine is limited you can walk the W in 4 days. Cost; bus – CLP 15 000/US$30 (return), entrance fee – CLP 21 000/US$32, ferry – CLP 18 000/US$28 (one way), camping at Paine Grande – CLP 6000/US$9. 9.30-9.45 – get off at the first stop Laguna Amarga to pay park entrance fee. 10.30 – get off the bus at Pudeto, go to the ferry ticket office to buy a ticket to Paine Grande. 11.30 – get off the ferry at Paine Grande. 11.30-12.00 – pitch your. Leave your stuff in the tent, take only valuables, water and snacks. 12.00 – start walking to the glacier – 11km, 2h30min. 14.30 – arrive at refugio Grey, spend some time walking around. If you have time go to one of the nearest view points. Remember the stretch between Grey campsite and Paine Grande closes at 4pm after that time you’re not allowed to start walking so make sure you start heading back before. Before 16.00 – start walking back to Paine Grande. In summer it gets dark after 9pm in Patagonia, on the way back you’ll have enough time to enjoy the view and take some photos don’t wast time on that on the way to the glacier. 18.00 – 19.00 – arrive at Paine Grande, have dinner, rest. From the second day follow the 5-day itinerary from Day 3. Go Pro Hero 7 makes it easy to take photos and videos, no need to worry about it getting wet plus it’s light, small and easy to use. LifeStraw filter we always drank tap water in Patagonia and never had any problem but we met some people in Torres del Paine that had stomach issues after drinking water from creaks or small rivers on the way. If you have sensitive stomach or concerned about getting sick rather use the filter. Small padlock to lock your tent when you leave. Classic Hikes of the World; 23 Breathtaking treks by Peter Potterfield. A great guide if you want to get some hiking inspiration. Hardcover. Walking Patagonia by Caspian Ray. It’s not a hiking guide but a fiction story about a young guy who went to Patagonia in search of adventure. Hello, Raini! Thank you for the comment! We’re glad our post was helpful! The main difference between 5 and 4-day itinerary is that you don’t stay at Grey campsite you just go there to see the glacier and come back to Paine Grande where you stay for the night, another thing is that you don’t go to Glacier Grey view point which is past Grey campsite but you do get to see the glacier from quite close. Just one question: if you take the 7:00 bus in Puerto Natales to get to the point, will you always make it to the catamaran on time? It looks like you only arrive 30min. before departure of the catamaran (if all goes well). Does it kinda wait for the 7am bus to arrive or does it just set of? Hello! Thank you for the comment! I’d say they’ll wait for the bus to arrive because they want to have more people on the catamaran (especially in April as it’s not high season), the majority of tourists arrives to Torres del Paine by bus. Buses run pretty accurate according to the itinerary. On the official site it says from 1st to 30th of April catamaran from Pudeto to Paine Grande leaves at 11am and 6pm. Hello, Peter! Thank you very much for the feedback! We’re glad our blog was helpful in your planning! Do you know if its possible to buy tickets for the Pudeto catamaran online? Hello, Andy! Thank you for the comment! As I’m aware you can’t buy tickets online but it shouldn’t be a problem to buy tickets at the pier. tnank you so much for such comprehensive instructions and itenerary! Hello, Maria! Thank you for the comment! We’re glad our post was helpful!